In this keynote, Dr. Michelle Chatman will discuss what it means to be a “humane institution,” one that uses its myriad resources — human, intellectual, creative, relational, and capitol — to address challenging social conditions, both within and outside of the walls of academia. Such an institution protects the vulnerable within its walls: women, queer and trans people, Muslims, people of color, the disabled, and the undocumented, among others. Many have had experiences of harm within, and by, their institutions. How do we create safer and calmer spaces to work, to teach, to dream, and to thrive? Michelle Chatman will discuss some of the tools to accomplish this, primary of which is the courage to confront our fears, challenge normalized epistemology based in western culture, and build interdisciplinary communities that engage in campus, community, and global social action. How do we, as scholars and activists, find our authentic contemplative voice as we lead our institutions in this work? Dr. Chatman will address how her institution is addressing Black youth criminalization, gentrification, and environmental sustainability using contemplative approaches. Being who we authentically are, within our institutional structures, culturally, socially, and spiritually — and inviting our students and colleagues to be their whole selves — reconnects us to what is too important to ignore or avoid, and recommits us to our deepest work. 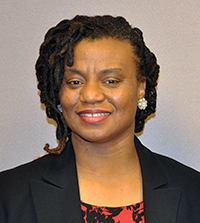 Michelle Chatman, Public Anthropologist, is Assistant Professor in the Crime, Justice, and Security Studies program at the University of the District of Columbia. Through her efforts, Dr. Chatman has increased the University of the District of Columbia’s utilization of mindfulness and contemplative approaches to enhance campus well-being, support student learning, and build stronger connections within and across the university. Her campus accomplishments include organizing a contemplative speakers series, hosting EXHALE (one day faculty Retreats), establishing the contemplative faculty learning community and Mindful Mondays, and bringing a national mindfulness conference to the UDC campus this Spring semester 2018. Her commitment to contemplative inquiry, social justice, and personal development, is also evidenced in the numerous workshops and presentations she has conducted around the country as UMass/Amherst, Smith College, Miami University/Ohio, Antioch University, Virginia State University, Community College of Baltimore County and numerous other venues. Dr. Chatman has also integrated mindfulness and contemplative approaches into her research endeavors. She is a Research Fellow in the Robert Wood Johnson Foundation’s Interdisciplinary Research Leaders Program. The fellowship includes training in health equity research along with a $350,000 grant to support her team’s research on using mindfulness, restorative justice and equity education as a violence prevention strategy among African American high school youth. Dr. Chatman was also recently selected to participate in the Transformative Educational Leadership Program, a yearlong program on Mindfulness-based Social, Emotional, Academic and Ethical Learning for K-12 Systemic Change. Michelle serves on the board of directors for the Center for Contemplative Mind in Society and the Mindfulness in Education Network. In her inspiring TEDx talk, How Africa Changed My Life, she links her contemplative journey to her volunteerism in The Gambia, West Africa, following her undergraduate experience at UDC, An emerging leader in this field, Dr. Chatman will be one of the featured speakers in the higher education track during the 2018 Mindfulness at Work Summit, which will kick off in June 2018.